Brother-and-sister cats Ginger and Moe have a perfect little family with their owners, Linda and Greg. Over time, however, Linda becomes allergic to her two cats. When the doctor tells her that her allergies will not get better as long as Ginger and Moe live with her, she's heartbroken and wonders what will happen to the cats now. Will Ginger and Moe ever find another loving home? It doesn't seem likely --until something incredible happens. 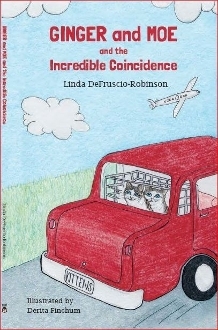 Ginger and Moe and the Incredible Coincidence is a heartwarming, true story that offers lessons about love, sacrifice, and the nature of fate. It takes a clear and sensitive approach to teaching young readers about allergies and serves as a powerful reminder that every challenge comes with the opportunity to find a creative solution. Copyright © 2016-2019 Linda DeFruscio. All rights reserved.